For a number of years now, Veeam has been talking about the 3-2-1 rule of backups, whereby you keep three copies of your backup data on two different media types with at least one of those backups held off-site. Traditionally, most organizations have been able to put this into play by taking advantage of on-premises storage and media hardware along with multiple data center locations to cater for the off-site backup solution. This is where off-site data backup services can come into play to satisfy the off-site backup services requirement. Off-site backup solutions offer numerous benefits to organizations, including increased efficiency and reliability based upon features and capabilities that not many companies may afford. There’s also no need to worry about infrastructure maintenance as that burden lies with the service provider, and the scalability of service providers can be leveraged without an upfront CAPEX spend. Another advantage of off-site backup solutions is accessibility, as the data is accessible from any internet-connected location and device. 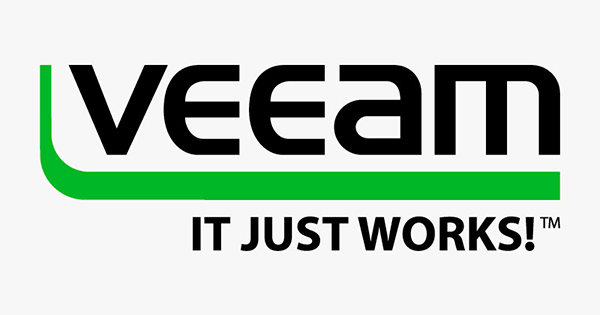 Since Veeam Backup & Replication v8, Veeam has offered Cloud Connect as a means for the Veeam Cloud & Service Provider (VCSP) partners to provide off-site data backup services. With Veeam Cloud Connect, they can give their customers the ability to leverage cloud repositories to store virtual machines in service provider facilities. By leveraging Veeam Cloud Connect Backup, a number of VCSPs around the world have built off-site backup solutions. The Veeam Cloud & Service Provider directory lists out VCSP partners in your region of choice… but how do you choose between them? Data sovereignty is a still a major concern for organizations looking to back up off site to the cloud. With the VCSP network being global, there is no shortage of locations to choose from to have as an off-site repository. Drilling down even further, some providers offer multiple locations within region, which can increase the resiliency and Availability of off-site backups and let you choose multiple repositories to further extend the 3-2-1 rule. It’s also a good idea to do some research into the service providers uptime and major event history, as this can tell you either way if a provider offering the off-site backup service has had any history of Availability issues. It’s hard to defeat the laws of physics, and in searching for an off-site backup solution you should think about how long the data you have in a cloud repository will take to restore. This goes beyond the basics of working out recovery time objectives (RTOs) in that taking backups off site means that you are at the mercy of the internet connection between you and the restore location and in the restore capabilities of the service provider. When looking for a suitable off-site backup solution, take into consideration the roundtrip time between yourself and the service provider network and also the throughput between the two sites making sure you test both, upload and download speeds to and from each end. 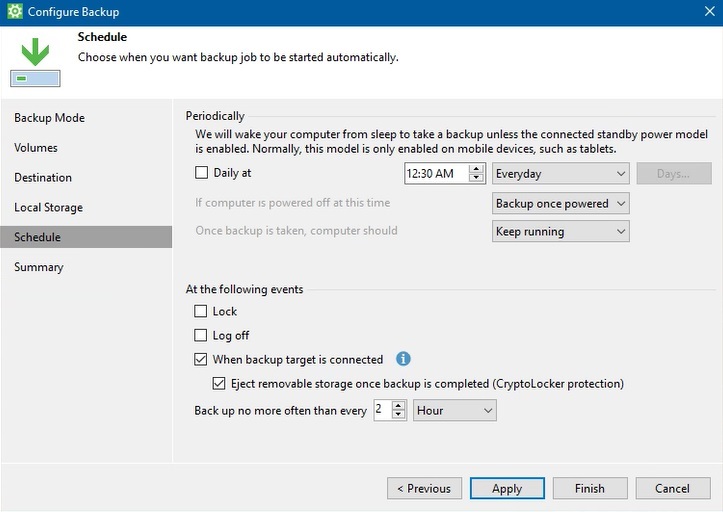 Note that Veeam-powered off-site backup services can improve recovery times compared to those that rely on tape-based backup due to Cloud Connect repositories at the service provider end being housed on physical disk. As with data locality, more and more organizations are looking for offsite backup solutions that meet or match their own certification requirements. This extends beyond more common data center standards such as ISO 9001 and 27001, but also now looks at more advanced regulatory compliance to do with data retention and goes as far as service providers abiding by strict security standards. If your organization is in a specific vertical, such as Healthcare’s HIPAA standard, then you may look for an off-site backup solution that is compatible with that. It’s also worth noting that service providers will offer differing service level agreements (SLAs) and this should be taken on board when searching for an off-site backup service. SLAs dictate the level of responsibility a service provider has when it comes to keeping to their promises in terms of services offered. In the case of off-site backup, it’s important to understand what is in place when it comes to integrity and security of data and what is done to guarantee access to your data when required. Multi-hypervisor support does come into play when looking forward towards extending off-site backup and looking at recoverability in the cloud. For example, Veeam Cloud Connect works with both VMware and Microsoft hypervisors, and VCSPs have the ability to offer one or both of these platforms from a replication point of view. However, with Cloud Connect Backup, the off-site backup repository is hypervisor agnostic; cloud repository is acting as a simple remote storage option for organizations to back up to. With Veeam Backup & Replication 9.5, you can now replicate from Cloud Connect Backups and choose a provider that has one or the other, or both hypervisors as platform options. Cost might seem obvious, but given the variety or services offered through the service providers it’s important to understand the difference in pricing models. Some service providers are pure infrastructure providers (IaaS) offering Backup as a Service (BaaS), which means you are generally paying for a VM license, storage and there might be additional charges for data transfer (however, this is fairly rare in the IaaS space). These service providers don’t cover any management of the backups — generally this is handled by managed service providers that wrap service charges on top of the infrastructure charges offering end-to-end off-site backup solutions. The five tips above should help you in searching for an off-site backup service. You need to remember that each service provider offers something slightly different, which means your organization has choice in terms of matching an off-site data backup service that suits your specific requirements and needs. My recommendations will also help you navigate through Veeam Cloud & Service Provider partners that leverage Veeam Cloud Connect for their off-site backup offerings. We have already talked about how secure backups can be in a cloud environment and what the cost may be of not leveraging the potential of DRaaS. The next step would be to start thinking about how to migrate your infrastructure or backups/replicas to cloud backups and at what scale it has to be done. We will review the main points that you need to consider and check prior to initiating your move into the world of cloud. Who can benefit from the cloud? The short answer is a bold one: Everyone. Regardless of the size of the operation, there is a good incentive in road mapping your migration over to the cloud as it brings a whole new level of accessibility, scalability and long-term cost savings. But what does that really mean? 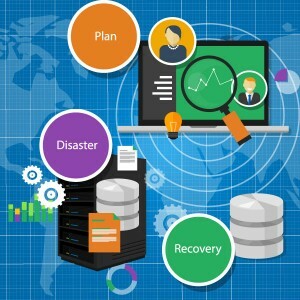 When it comes to conventional disaster recovery sites, it’s hard to plan everything beforehand because you have no way of knowing when the disaster is going to strike and at what scale. You’re only as flexible as the hardware that you’re provided with. Any additional capacity would require time and more money to acquire and install. That’s where the cloud steps up the game. You are presented with a variety of options that allow you to build a flexible DR environment with the ability to grow and shrink its capacity at will. The only price you’ll pay is for the actual hardware in use, thus granting an incredible scalability that is ready for any DR needs. Not every provider possesses such ability at a full scale, but there’s plenty of options to pick from based on your particular needs. The two approaches Veeam has for businesses with on-premises deployments wanting to get backups or replicas to the cloud are Backup as a Service (BaaS) and Disaster Recovery as a Service (DRaaS). These approaches utilize cloud and service provider technologies which are flexible enough for any use case and you can avoid the cost and complexity of building and maintaining an offsite infrastructure. So, how hard is it to migrate to the cloud? What’s important to remember is that migrating data to the cloud is not a one-day feat and is a project that will require planning and a timeline. However, depending on what data management software you use, getting data offsite to the cloud can be a very simplified experience. Migrating to the cloud certainly doesn’t require you to drop all the investments in your existing DR infrastructure, should you have one. If you’re already running an on-premises infrastructure, then you know that any hardware has its lifecycle and will eventually be replaced. So, you can plan to move your servers and applications to the cloud environment as the time for hardware renewals shows up on the calendar. If you’re just starting off at the stage of designing your infrastructure then it would be even more beneficial, as you are getting high-class disaster-proof hardware used on Enterprise levels of operation at an affordable price and right-away at your disposal. No need to worry about building and maintaining your own DR site, all the more so about the time to set everything up from scratch. In any case scenario, Veeam® has the tools to make your migration to the cloud as easy as your daily backup tasks. In fact, even though Veeam Cloud Connect Backup and Replication are used for archival purposes and providing continuous synchronization, they’re a perfect instrument for migrating your infrastructure to the cloud without any hassle. What should be migrated first? The first contenders are the servers that will fully benefit from the flexibility and added performance of the cloud. But, not every server or application needs to or can be migrated right away. You need to plan it in the way that won’t obstruct your production performance more than usual hardware migration or upgrade. It’s important to make sure the migration to the cloud won’t cause you trouble during the process or after the completion. That can be done by testing the performance of servers or applications in the lab to find out about any hiccups beforehand. Sometimes an existing set of dependencies, like an on-site SQL database or Active Directory, can make it harder to simply move some applications without correcting their workflow. In such scenarios the use of hybrid cloud might be helpful. In a hybrid setup one part of your cloud infrastructure is private and running under your full control on-premises and the other part is in public cloud, making use of all the servers that are easily moved to cloud or will benefit from it the most. No matter the size of the infrastructure, Veeam Cloud Connect offers a solution to fully control and easily migrate on premises data to highest standard cloud environments – requiring no network (VPN) setup or change to the customer environment. And whether you plan on implementing a big bang migration strategy or the trickle migration strategy, Veeam Cloud Connect allows for both methods. Veeam have put together an excellent guide ‘The Essential Guide to the Biggest Challenges with Cloud Backup & Cloud Disaster Recovery‘. As one of our chosen backup partners, I urge any data and data security conscious I.T Admin to review this document, it gives a great overview on Veeam’s newest technology such as ‘Disaster Recovery as a Service’ and its benefits over more traditional modes of disaster recovery. Since the public cloud providers strengthened their ability to replicate complex on-premises environments, and as software vendors developed more powerful DRaaS-enablement technology, DRaaS has become a more powerful option for organizations compared to traditional disaster recovery sites. This is perhaps one the biggest features included within v9 – all to often we see environments over provision the storage for their backup repositories – you never know when we might get a large delta or incremental and the last thing we want to have to do is go through the process of running out of space and having to provision more. In the end we are left with a ton of unused and wasted capacity, and when we need more instead of utilizing what we have we simply buy more – not efficient in terms of capacity and budget management. This is a problem that Veeam is looking to solve in v9 with their Unlimited Scale-out Backup Repository functionality. In a nutshell the scale-out backup repo will take all of those individual backup repositories you have now and group them into a single entity or pool of storage. From there, we can simply select this global pool of storage as our target rather than an individual repository. Veeam can then chose the best location to place your backup files within the pool depending on the functionalities and user-defined roles each member of the pool is assigned. In an essence it’s a software defined storage play, only targeted at backup repositories – gone are the days of worrying about which repository to assign to which job – everybody in the pool! Backup and restore from storage snapshots is no doubt a more efficient way to process your backups. Just as Veeam has added support for HP 3PAR/StorVirtual and NetApp, we are now seeing EMC Dell thrown into that mix. 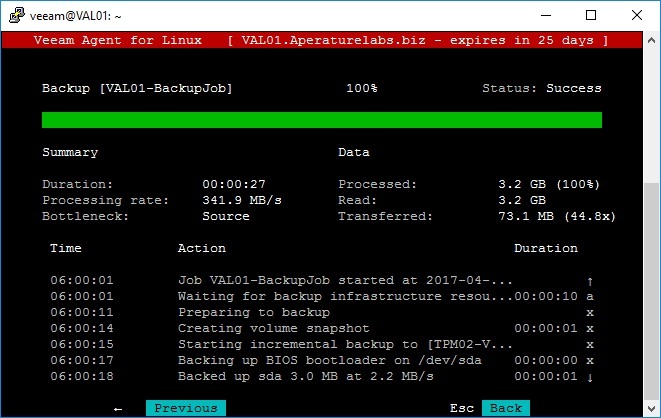 As of v9 we will now be able to leverage storage snapshots on EMC VNX/VNXe arrays to process our backup and restores directly from Veeam Backup and Replication – minimizing impact on our production storage and allowing us to keep more restore points, processing them faster and truly providing us with the ability to have < 15 minutes RTPO. On the repository end of things we’ve seen the integration provided for DataDomain and Exagrid – as of v9 we can throw HP StoreOnce Catalyst into that mix. 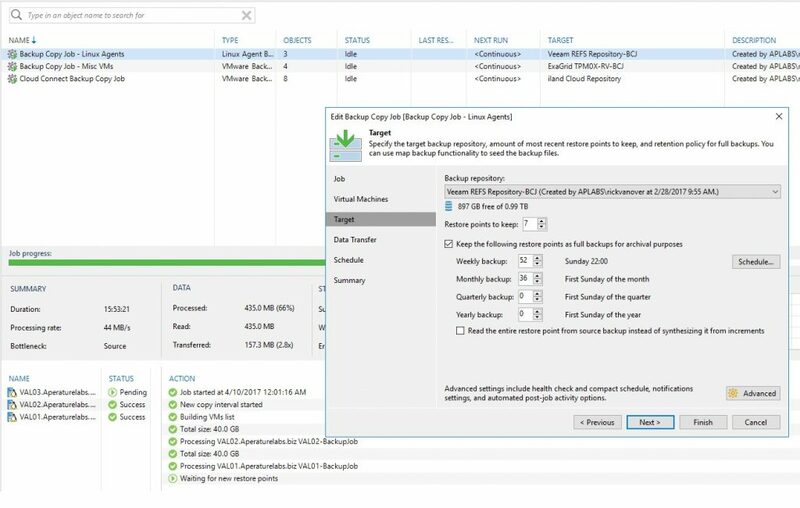 Having a tighter integration between Veeam and the StoreOnce deduplication appliance provides a number of enhancements in terms of performance to your backups and restores. First off you will see efficiencies in copying data over slower links due to the source side deduplication that StoreOnce provides. StoreOnce can also create synthetic full backups by performing only meta data operations, eliminating the need to actual perform a copy of the data during the synthetic creation, which in turns provides efficiency to a very high i/o intensive operation. And of course, creating repositories for Veeam backups on the StoreOnce Catalyst can be done directly from within Veeam Backup & Replication, without the need to jump into separate management tools or UIs. Last year Veeam announced the Cloud Connect program which essentially allows partners to become somewhat of a service provider for their customers looking to ship their Veeam backups offsite. Well, it’s 2015 now and we now can see that the same type of cloud connect technology now is available for replication. Shipping backups offsite was a great feature, but honestly, being able to provide customers with a simple way to replicate their VMs offsite is ground breaking. Disaster Recovery is a process and technology that is simply out of reach for a lot of business – there isn’t the budget set aside for a secondary site, let alone extra hardware sitting at that site essentially doing nothing. Now customers are able to simply leverage a Veeam Cloud/Service Provider and replicate their VMs on a subscription based process to their data center. When VMware introduced the VMware API’s for Data Protection (VADP) it was ground breaking in what it provided vendors such as Veeam the ability to do in terms of backup VADP is the grounds to how Veeam accesses data in their Direct SAN transport mode, allowing data to be simply transferred directly from the SAN to the Veeam Backup and Replication console. That said VADP is only supported on block transports, limiting Direct SAN to just iSCSI and Fibre Channel. In true Veeam fashion when they see an opportunity to innovate and develop functionality where it may be lacking they do so. As of v9 we will now be able to leverage Direct SAN mode on our NFS arrays using a technology called DirectNFS. DirectNFS will allow the VBR console server to directly mount to our NFS exports, allowing Veeam to process the data directly from the SAN, leaving the ESXi hosts to do what they do best – run production! The opportunities that vPower and Virtual Labs have brought to organizations has been endless. Having the ability to spin up exact duplicates of our production environments, running them directly from our deduplicated backup files has solved many issues around patch testing, application upgrades, etc. That said up until now we could only use backup files as the grounds for getting access to these VMs – starting with v9 we can now leverage storage snapshots on supported arrays (HP, EMC, NetApp) to create completely isolated copies of the data that resides on them. This is huge for those organizations that leverage Virtual Labs frequently to perform testing of code or training. Instead of waiting for backups to occur we could technically have a completely isolated testing sandbox spun up using Storage Snapshots in essentially, minutes. A very awesome feature in my opinion. Those customers who currently use Veeam and have multiple locations we will be happy to hear about some of the enhancements that v9 has centering around Remote/Branch Offices. A typical configuration in deploying Veeam is to have a centralized console controlling the backups at all of our remote locations. In v8, even if you had a remote proxy and repository located at the remote office, all the guest interaction traffic was forced to traverse your WAN as it was communicated directly from the centralized console. In v9 things have changed – a new Guest Interaction Proxy can be deployed which will handle then handle this type of traffic. When placed at the remote location, only simple commands will be sent across the WAN from the centralized console to the new GIP, which will in turn facilitate the backup of the remote VMs, thus saving on bandwidth and providing more room for, oh, I don’t know, this little thing called production. When it comes to recovery things have also drastically changed. In v8 when we performed a file-level recovery the data actually had to traverse our WAN twice – once when the centralized backup console pulled the data, then again as it pushed it back out to it’s remote target – not ideal by any means. Within v9 we can now designate and remote Windows server as a mount server for that remote location – when a File-level recovery is initiated the Mount Server can now handle the processing of the files rather than the backup console, saving again on bandwidth and time. “Veeam Backup & Replication console is already running” <- Any true Veeam end-user is sure to have seen this message at one time or another, forcing us to either find and kill the process or yell at someone to log off. As of v9 the Veeam Backup & Replication console has now been broken out from the Veeam Backup & Replication server, meaning we can install a client on our laptops in order to access Veeam. This is not a technical change in nature, but honestly this is one of my favorite v9 features. I have a lot of VBR consoles and am just sick of having all those RDP sessions open – this alone is enough to force me to upgrade to VBR v9 . The way Veeam is storing our backup files is coming with another option in version 9. Instead of having one large backup file that contains multiple VMs we can now enable what is called a “Per-VM backup file chain” option. What this does store each VMs restore points within the job in their own dedicated backup file. Some advantages to this? Think about writing multiple streams inside of parallel processing mode into our repositories – this technically should increase the performance of our backup jobs. Certainly this sounds like an option you may only want to use if your repository provides deduplication as you would lose the deduplication provided job-wide by Veeam if you have enabled this. The Veeam Explorers are awesome, allowing us to restore individual application objects from our backup files depending on what application is inside it. Well, with v9 we have one new explorer as well as some great improvements to the existing ones. Veeam Explorer for Oracle – new in v9 is the explorer functionality for Oracle. Transaction-level recovery and transaction log backup and replay are just a couple of the innovative features that we can no perform on our Oracle databases. Veeam Explorer for MS Exchange – We can now get a detailed export report which will outline exactly what has been exported from our Exchange servers – great for auditing and reporting purposes for sure! Another small but great feature – Veeam will no provide us with an estimation in terms of export size for the data contained in our search queries. At least we will have some idea as to how long it might take. Veeam Explorer for MS SQL – One big item that has been missing from the SQL explorer has been table-level recovery – in v9 this is now possible. Also in v9 is the ability to process even more SQL objects such as Stored Procedures, functions and views as well as utilize a remote SQL server as a staging server for the restore. Veeam Explorer for SharePoint – As much as I hate it SharePoint is still widely used, therefore we are still seeing development within Veeam on their explorer. In v9 we can process and restore full sites as well as site-collections. Also, list and item-level permissions are now possible to restore as well.